With the X-ray tube we have recently acquired we want to try to make a diffractometer ! X-ray diffraction is one of the most important techniques for the study of crystalline solids. 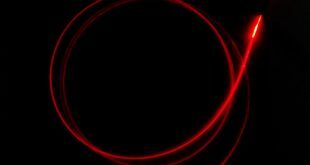 The X-ray diffraction technique is based on coherent elastic scattering : the macroscopic phenomenon of diffraction arises from the coherent sum of all the electromagnetic waves scattered by atoms that are found along the same family of reticular planes. 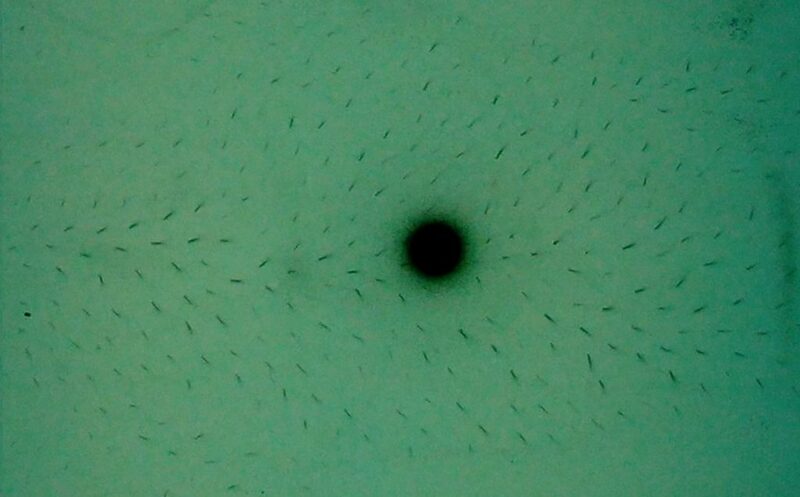 To produce diffraction it necessarily requires the presence of a reticular order, as found in the crystals, although this phenomenon can be successfully observed even in liquids. Depending on the nature of the sample under examination the technique is divided into single crystal diffraction (SC-XRD) and powder diffraction (XRPD). The first technique is able to give three-dimensional information on the electronic density and thermal motions of each crystal-forming atom: however, the difficulty of obtaining single crystals and the complexity of data analysis make it a non-routine technique. The X-ray diffraction of powders, which is much faster and cheaper, is extremely widespread, and allows to quantify the various components of a solid sample, and to obtain information on the crystalline structure and on the crystallite size. X-ray crystallography is a technique of crystallography in which the image, produced by X-ray diffraction through the atomic lattice present in a crystal, is recorded and then analyzed to reveal the nature of the lattice. Typically, this leads to determining the material and molecular structure of a substance. The dimensions of the crystal lattice can be determined by the Bragg’s Law. The electrons that surround the atoms, rather than the nuclei of the atoms themselves, are the particles that physically interact with the X-ray photons. In X-ray crystallography, an X-ray beam hits the crystal itself and is then diffracted in specific directions. 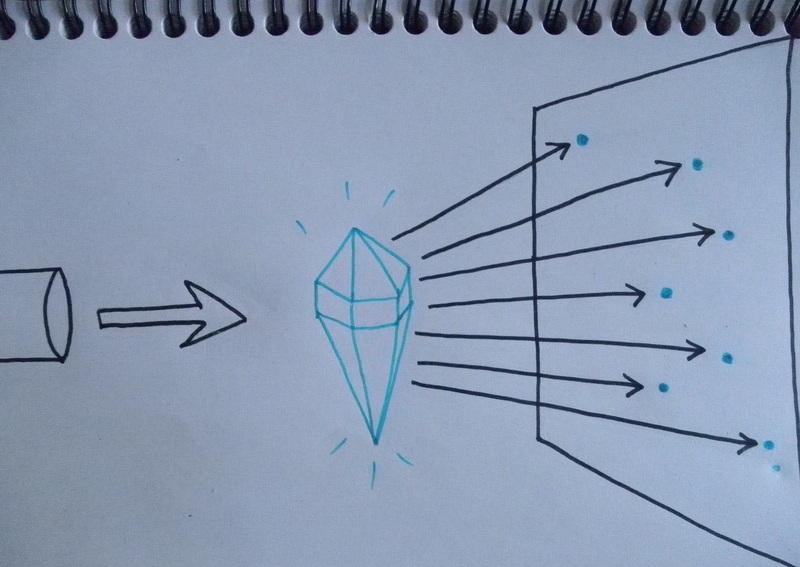 Depending on the angles and the intensity of these diffracted rays, a crystallographer can produce a three-dimensional image of the density of electrons in the crystal. From this it is possible to derive the average position of atoms, as well as their chemical bonds and other information. 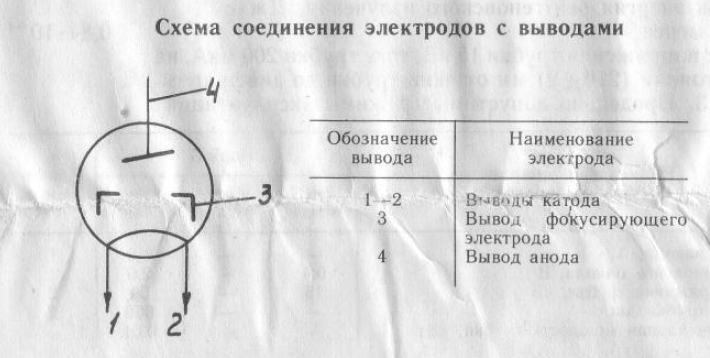 The images below show the Soviet-made BH4 tube. 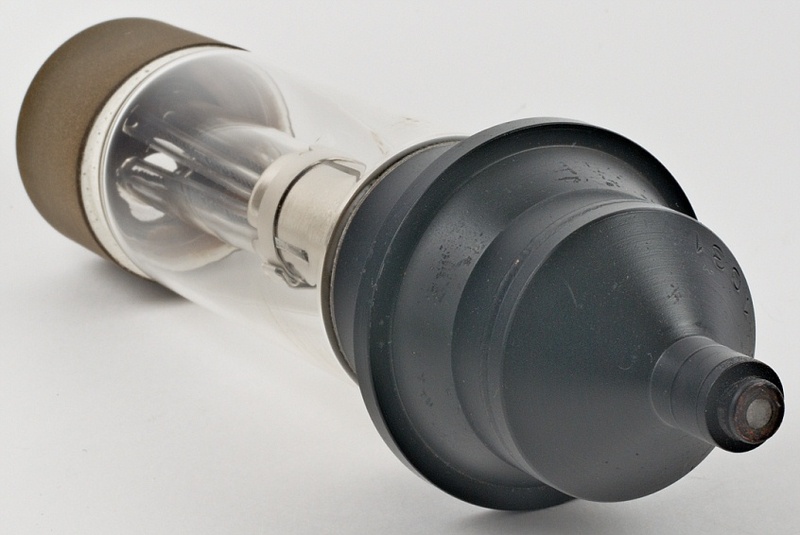 This is a tube with a frontal emission window, heavily shielded in the anodic area. The beam exits the front window on the “protuberance” seen in the second image. The BH4 tube is available in two types: anode in Silver or an anode in Germanium. Our tube is in Germanium. 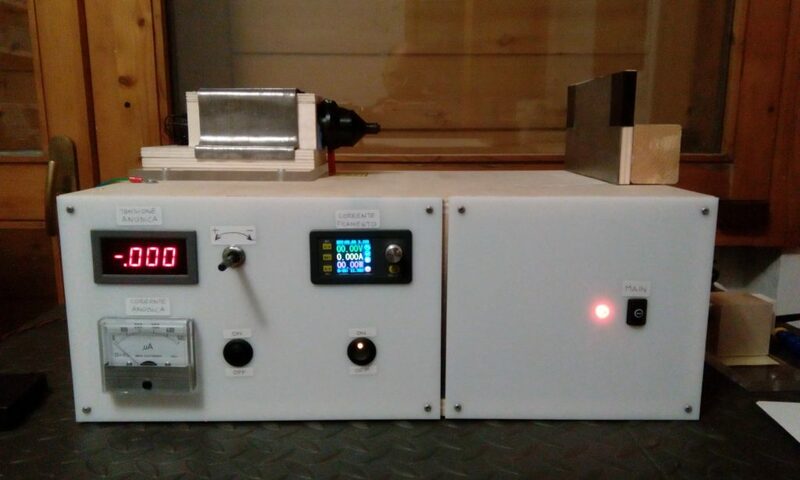 The tube is designed to work with an anodic voltage of up to 50 KV, while the operating working range is between 20 and 40 KV, while the anode current must be between 200 and 600 μA. 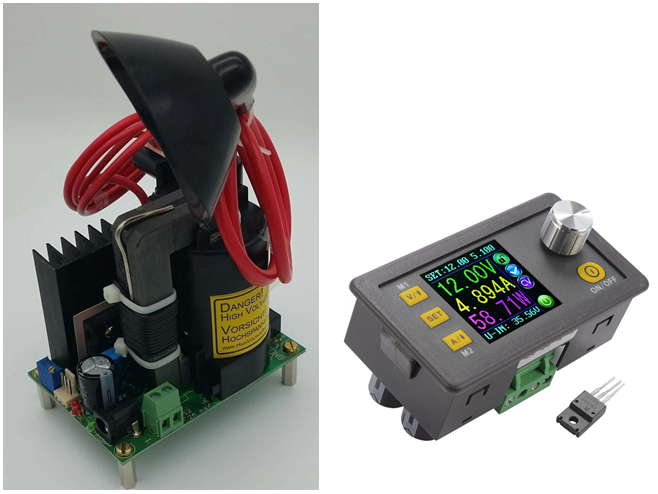 The anodic current is effectively controlled by the filament whose maximum current is 3.5 A. The collimated output beam, the shield, the Germanium anode and the non-prohibitive electrical parameters make this tube a good candidate for being the X source of a small “amateur” diffractometer. The diagram below, taken directly from the original manual, shows the connections: terminals 1 and 2 are those of the filament, the electrode 3 is the cathode, while the electrode 4 is the anode; the anode corresponds to the metal cap on the front of the tube. The graphs below, also taken directly from the original manual, show the I / V characteristics of the filament and of the cathode-anode circuit. From the constructive characteristics of the tube it can be deduced that the anode, not being isolated, was thought to be connected to ground, while the cathode was fed to a negative voltage, together with the floating supply of the filament. Instead, in our configuration we have grounded the cathode and connected the anode to the positive high voltage: this connection is simpler but we must pay attention to the surfaces that lead to high positive voltage ! The image below shows our setup. 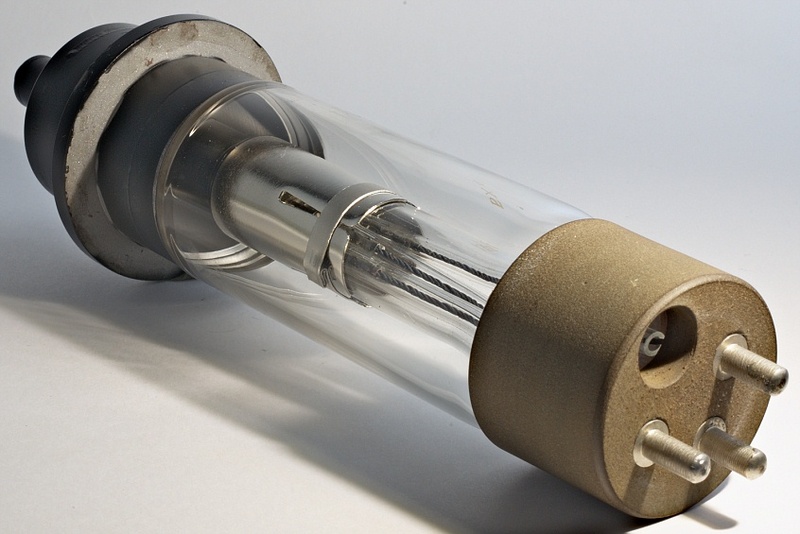 The tube was placed in a wooden container, which in turn was isolated from the base with a sheet of Plexiglas. The tube was further shielded with 12-tenth lead plate. You can glimpse the red cable that carries the high voltage to the anode. In front of the tube emission window a steel – lead collimator was placed with a passage hole of about 1 mm. At the exit of the collimator, an X-ray beam with a cross-section of about 1-1.5 mm is obtained. The image on the side shows a “radiography” of the beam at the exit of the collimator. By placing a geiger counter in front of the collimator you can easily reach count values ​​higher than 1000 CPS, increasing current and anodic voltage it is easy to saturate the geiger counter that reaches a maximum of 2000 CPS. 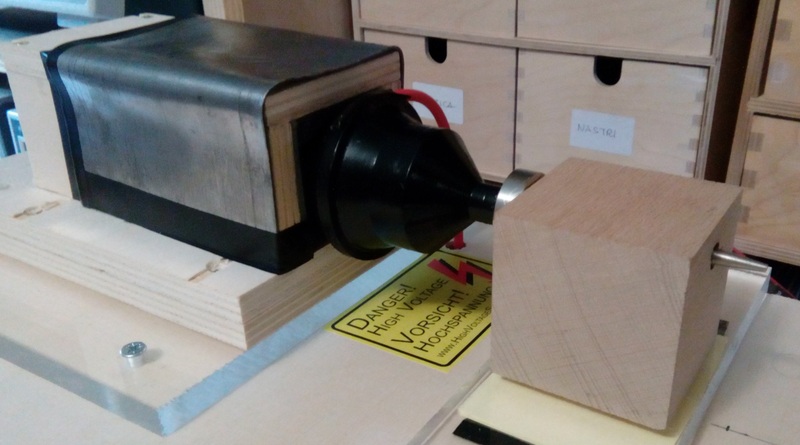 The emission of the X-ray tube was checked with the XRF spectrometer (described in the post DIY XRF Spectrometry). The graph below shows the spectrum acquired with our DIY probe, based on a thin CsI(Tl) scintillator crystal coupled to a PMT. Powered at a voltage of 30 KV, the X-Ray tube with anode in Germanium generates a strong emission at about 10-12 KeV, which corresponds to the characteristic Kα and Kβ lines of Germanium, superimposed to a continuous that reaches, more or less, the maximum anodic voltage. The graph below shows in red the emission of the tube and in green the emission obtained after a filter consisting of a thin gallium sheet which cuts the energies higher than Kα. The gallium filter makes it possible to obtain a practically monochromatic emission at the Kα line of the Germanium. 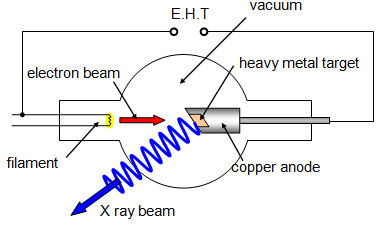 The electrical connections of the X-Ray tube are fairly simple. The basic scheme is shown in the image aside : there are two circuits, the HV circuit between anode and cathode with the anode at +HV and the cathode grounded and the filament circuit with low voltages but high current. The HV value should be tunable, the same goes for the filament current. It is advisable to measure both the HV value and the anodic current. This can be accomplished with a proper GΩ resistor and a μ-ammeter. The filament current, which in turn controls the anodic current, must be controlled accurately. The image below shows the HV transformer (max 40 KV) which allows the adjustment of the HV value, and the power supply equipment for the filament. The other image shows the entire equipment. 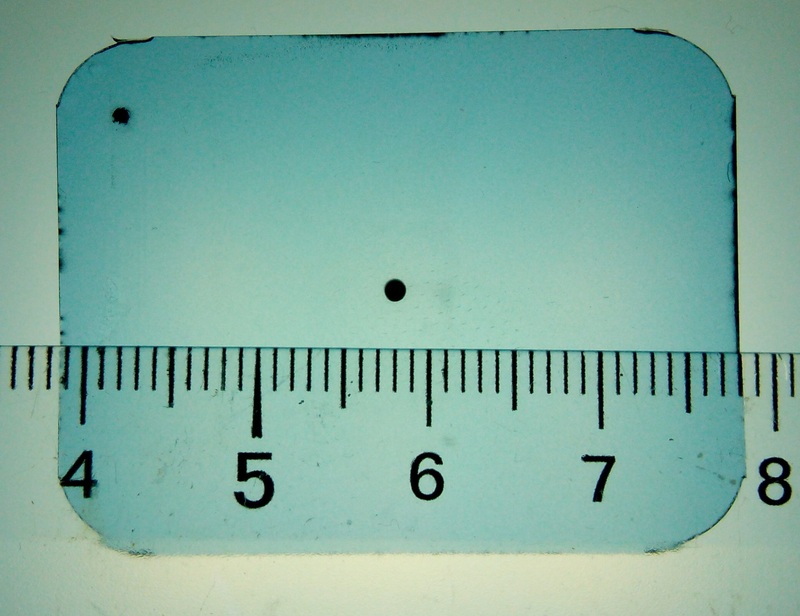 The X-ray tube and the collimator are completed with a rudimentary goniometer obtained from a rotating plate designed for use in the maker robotic field. The accuracy is not high and unfortunately it is not possible to constrain the rotation of the detector and the crystal in order to automatically satisfy the Bragg law θ: 2θ, this means that both the detector and the crystal must be positioned manually. The image below shows the rotating plate, at the top right there is the collimator with the exit hole of the beam, on the left there is the detector-holder with the collimation slit. 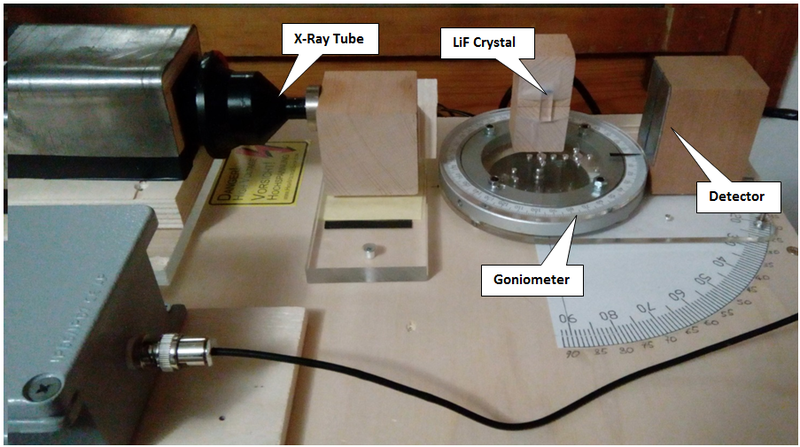 The image above shows the setup for carrying out the Bragg diffraction measurement of a lithium fluoride single crystal. 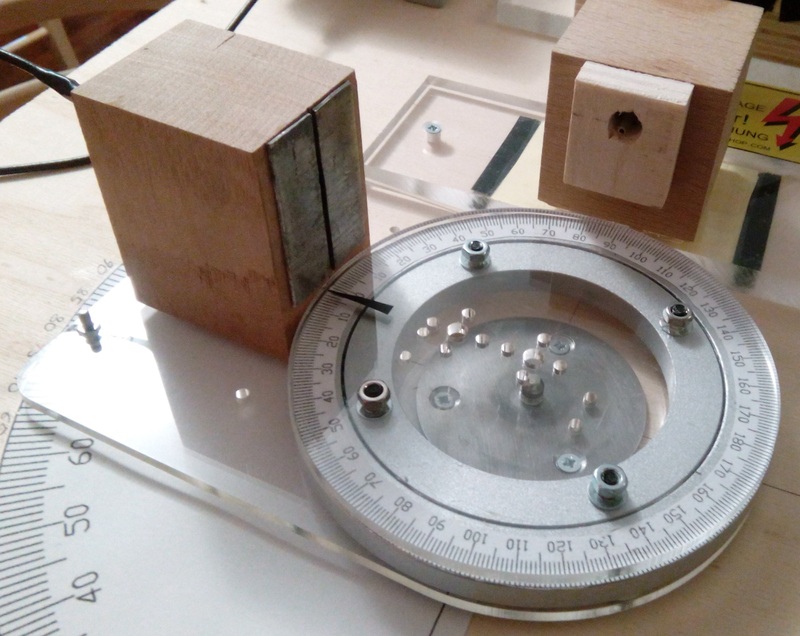 The crystal is mounted on the rotating plate of the protractor. 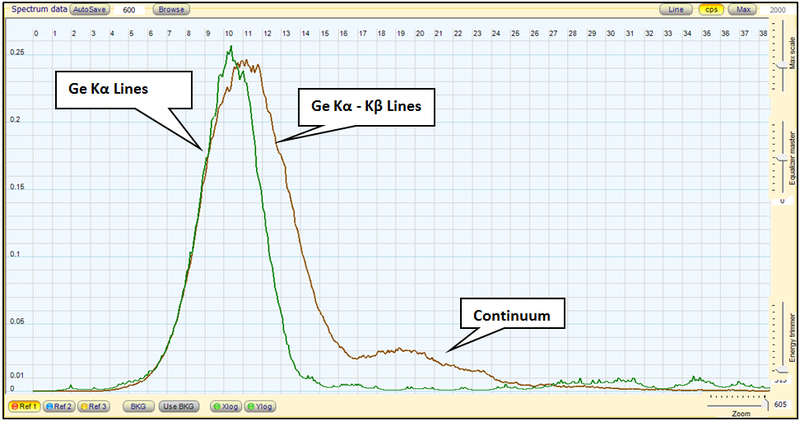 The graph below shows the results of the measurements, which clearly show the peaks corresponding to the Kα and Kβ emissions of Germanium. The intensity of the peaks is not particularly high and the spatial resolution is only 1 ° – 2 °, despite this the result is appreciable. The diffractometer can also be effectively used for experiments on “Laue” diffraction. In this case the sample under examination, single crystal or polycrystalline, is placed immediately in front of the collimated beam and the diffraction reflections are recorded on an x-ray film. The image above shows the setup. The image below is instead the result obtained by examining a thin sheet of pyrolytic graphite with the collimated X-beam. The exposure lasted approximately one hour (60 min) and the tube was operated at 20 KV / 100 μA. The dark spot in the center is the trace left by the beam transmitted, while the dots around are the traces left by the diffracted X-rays. Working in transmission it is important to minimize the absorption and therefore the sample must be very thin. From the Laue images it is possible to obtain information on the crystalline structure of the sample in question.